Freedom suffered yet another blow today. Much like America did in 1776, Scotland had a chance to put the British in their place and declare freedom for themselves. 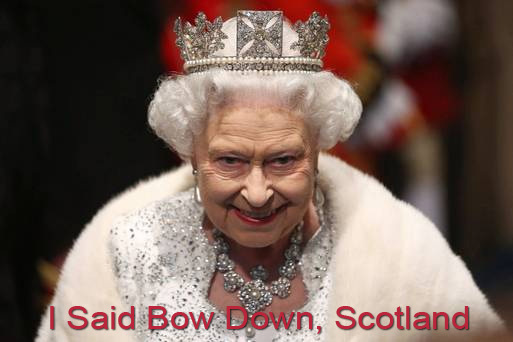 Instead of doing the right thing and declaring war on England, the Scots voted to crawl and kiss the feet of Queen Elizabeth. I can guarantee you right now, William Wallace is up in heaven with George Washington and Andrew Jackson, spitting on all the weak-kneed, skirt-wearing Scotsmen who have betrayed a freedom that was 300 years in the making. [/pullquote_left] But they will. Wrong!